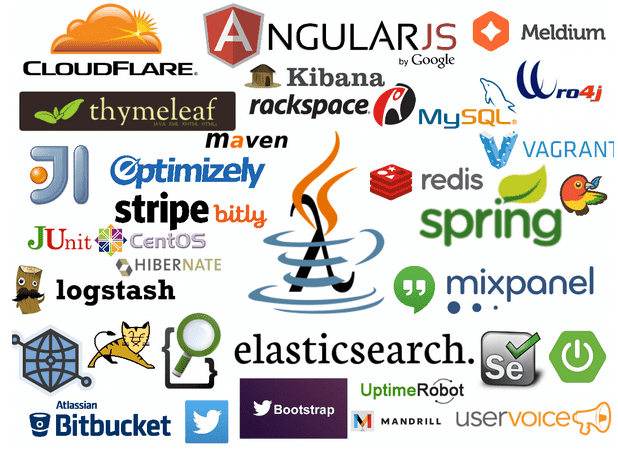 Java technology stack for Silicon Valley web apps. How the story begins? In brief – we were facing a Java web application with 5000 active users which were unavailable most of the time, most probably because of multiple memory leak issues. A script was running that restarts the Tomcat server when it becomes unavailable. The functionality was broken – users could not login and use properly the rest of the functionality. More about the story here. 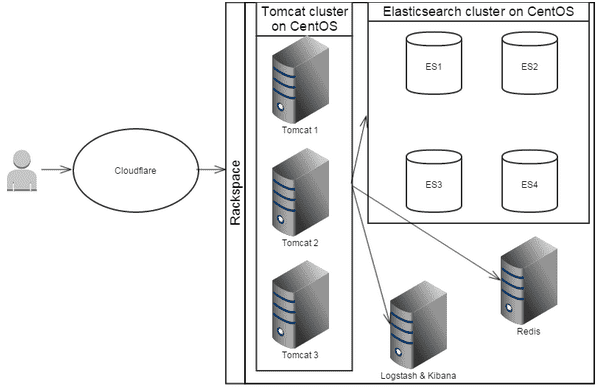 Elasticsearch – used for storing some searchable data. Stripe – Online payment provider with great API. You can easily switch in test mode and you can make json test queries through curl. Logstash – elasticsearch based server to store log messages. Kibana – interface for Logstash/Elasticsearch. Easily search and filter logs. 3 servers with running Apache Tomcat. One of them contains the web application and the other 2 were used in cluster for the Spring Quarts, which actually load the system. The most important issue to fix was that users were unable to login. After some debugging, digging into the code and the systems we found the problem. It was the Elasticsearch itself. Elasticsearch was used as a database. It does not support ACID transactions. This means that when you put something (like Twitter authentication token) there is no guarantee that it is available for reading the next moment. What happens is that the authentication system tries to read the login token which is saved through a callback using another node. The token is not replicated in all the nodes, the authentication mechanism cannot find it and the user cannot login. Most of the memory issues were related to the Spring message queue. It was trying to save data in the Elasticsearch, or calling some external services (geoip, etc). Those operations became very slow with increasing the system load. The queue was filled with messages which could not be dispatched and it started to take too much memory. Restarting the server cleans the queue but the data is lost. We decided to store the data in MySQL server and leave only the statistic data into single node Elasticsearch server. One more reason to make this decision was that all the persistence model and ORM was implemented in the code which was harder to maintain than the JPA/Hibernate model. The migration was not an easy process since we had to reimplement all the queries. After the migration we have 1 server running Tomcat, Elasticsearch and Redis and 1 more for Logstash. With the same user’s load we have now 30% resource usage and 75% less servers which reduced the monthly expenses by 50%. Consider the technology stack. Using popular tools and frameworks is cool but developers have to be careful when putting them working together. Elasticsearch is a great tool, but it is designed for search not to serve as a database. We have some problems with the integration of Angular.JS and WRO on the front end side. The rule of 3. At least 3 engineers should make an estimation of a task. We did make a mistake thinking that the migration from Elasticsearch to MySQL would be an easy process. If we had spent more time on estimating this could not be the case. Set up a process. Thinking that it is a short task we couldn’t manage to setup a proper process. This led to unknown delivery terms, missed deadlines, communication overload and more. Implement stress test with Gatling so we’ll be able to predict when the system will crash under the user’s’ load. Spring cache and Redis for session management. Store the session objects in Redis so we can add, remove tomcat nodes on demand. Do you have you experience with the technologies listed above? Have you ever used Elasticsearch as a database? Try Gradle instead of Maven – it’s working much faster.. Thanks for the advice! Will give it a try in my next Java adventure! Very nice adventure indeed, I was just wondering if you ever tried using nginx cluster in-front of tomcat? It was a nice adventure and it is still ongoing. You can check twibble.io for the result. We are on the road of clustering Tomcat and nginx will be one of the options we’ll consider. Would you recommend it? How was your experience with it? Such an useful post. I really liked your honesty about the whole process. I’m searching about elasticsearch and by reading your post, i’m discarding the idea of using it as a database. Thanks for sharing your experience. Also, i’m amazed at the number of techologies your team managed to work in harmony together. Thank you for the time reading our article. Sometimes a product needs the mix of many different technologies to achieve what’s desirable. For sure don’t use elasticsearch as database.